Me: "I brought this cup in with me." Man 1: "I didn't see you bring in the cup." Man 2: "I didn't see you bring it in either." Man 1 & 2: "No, you didn't bring that cup in." Me: "Ok, well look - here is the dent from where the cup has been sitting in my car and I can show you the puddle outside of my car from where I dumped out the warm water to refill it with cold." Man 1 & 2: "Well next time you need to show us the cup, but we still don't think you brought that cup in here with you." Me: "So, do you want me to pay you then?" You can tell when someone does and doesn't believe you and they most definitely think I am a thief. Naturally, the next day, I stopped by the same 7-11 on my way to rehearsal. Man 1 was working with a line of 5 or 6 people at the register, but I SHOUTED as I entered, "I'm bringing in a refill cup!" As I walked out, not even waiting in the line, I just shouted, "I just filled it up with water!" He nodded and said, "Thank you." The lesson I learned? The people at 7-11 like annoying, loud people more than honest, quiet people. 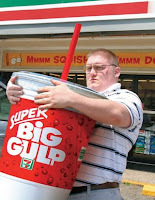 I just wanted a super big gulp of water! I tried a translator to get that sentence into Latin. The translation it gave me, I could tell, wasn't about telling the truth, but was the other version of "lie," which, uh, I guess nuns, in a way, don't really do either. I wish I was there with you at the 7-11. Too funny!